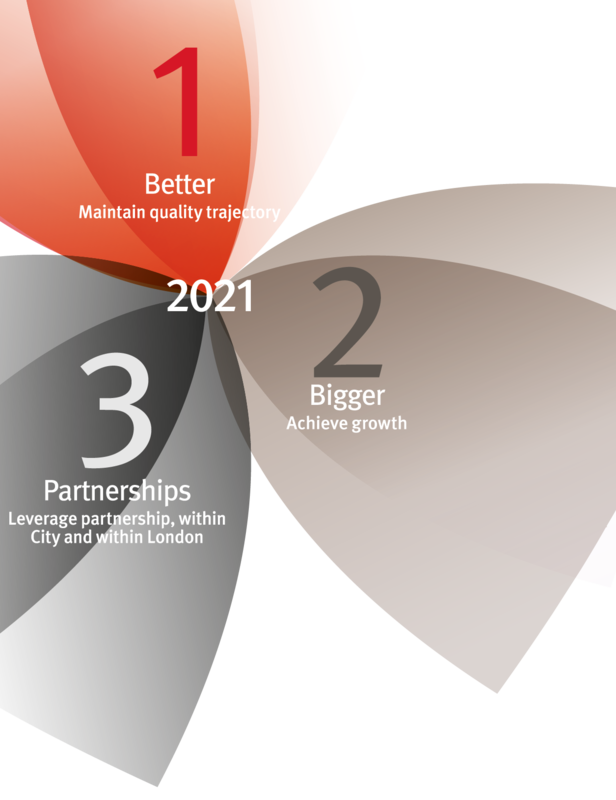 Working together, we will retain our unwavering focus on quality, grow where we can maintain our quality and build on our partnerships within City, within London and across the world. Maintain quality trajectory (‘better’). Build on the quality focus of the Strategic Plan 2012 to 2016 and maintain City’s current upwards trajectory in research intensity, research quality, education quality and student experience more widely. Further improving quality will remain vital to our success and is what drives the people who work at City and attracts the students whose lives will be enhanced through their time here. City also plans to grow, with a firm guiding principle of ‘quality-constrained growth’, growing while maintaining or increasing quality. Achieve growth (‘bigger’) in a way which maintains quality. Growth is important to achieve the critical mass necessary for both research excellence and educational experience and effectiveness. Critical mass can result in improved quality without significant increases in costs (through economies of scale). Over the next five years growth will come vertically for existing subjects that have momentum and horizontally, where City’s existing strengths can be leveraged through new and joint degrees or shared pathways and through improved student retention. Growth in student numbers will be accompanied by growth in research and enterprise income as City builds further on its internationalism and seeks a wider range of income sources. Leverage partnerships within City, within London (including through the University of London) and internationally with the aim of making us far more connected. These strategic priorities will guide City’s activity over the next five years and will be made operational through the Education & Student Strategy, Research & Enterprise Strategy, Internationalisation Strategy, People Strategy, School and Professional Service Strategic Plans and, ultimately, people’s individual objectives reviewed as part of the annual appraisal round.